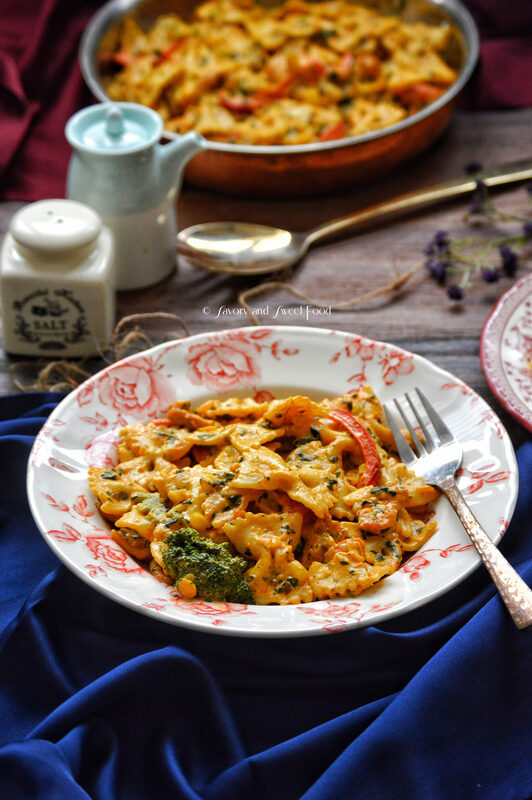 A chicken pasta with a loads of spice, creamy sauce, crunchy veggies and succulent chicken. 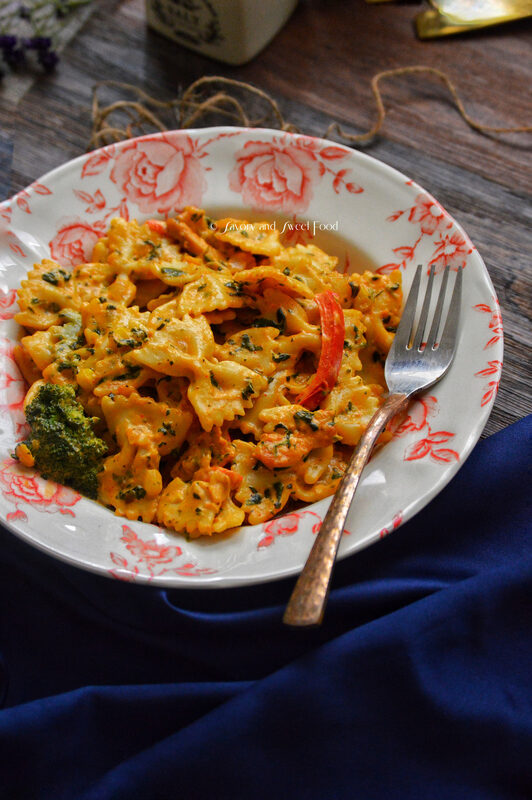 You can easily skip the chicken and make this a veggie pasta and it will still have lots of flavor. I love creamy rich pasta, especially these light orange colored ones. This color indicate that it will have a definite amount of spice in it. I need heat in my pasta sauces, otherwise I just cannot enjoy it. Oh yeah but I don’t relish the classic tomato sauce pasta, maybe because I don’t like tomatoes much. This one doesn’t have tomatoes at all and that, I like. If you have been following my blog for sometime, you may have noticed that most of the pasta recipes are on the spicier sides. 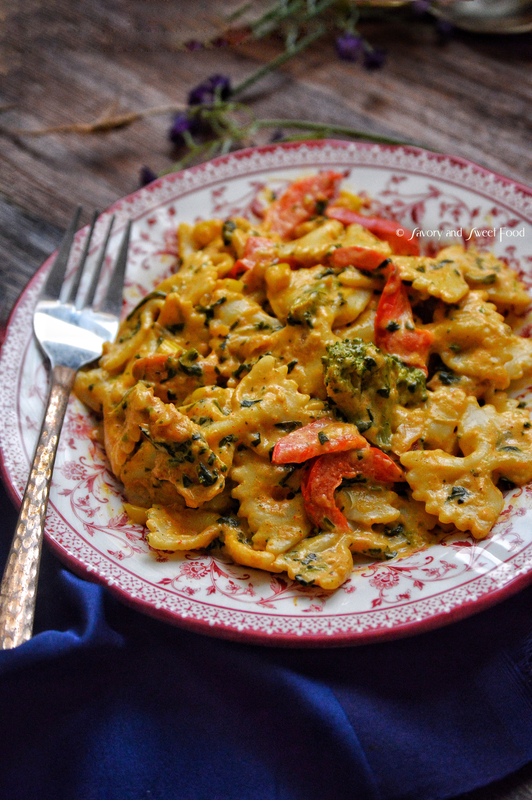 Like this Cajun Chicken Pasta, which is ridiculously yummy. 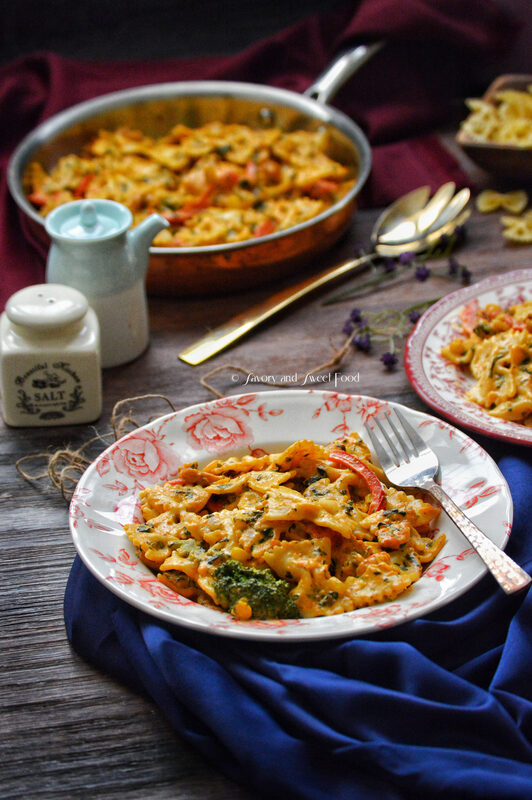 Then there is this recipe of Chicken Tikka Masala Pasta, which gave fame to my blog on Pinterest :), the other one is Chicken Fajita Pasta which is sooo good. 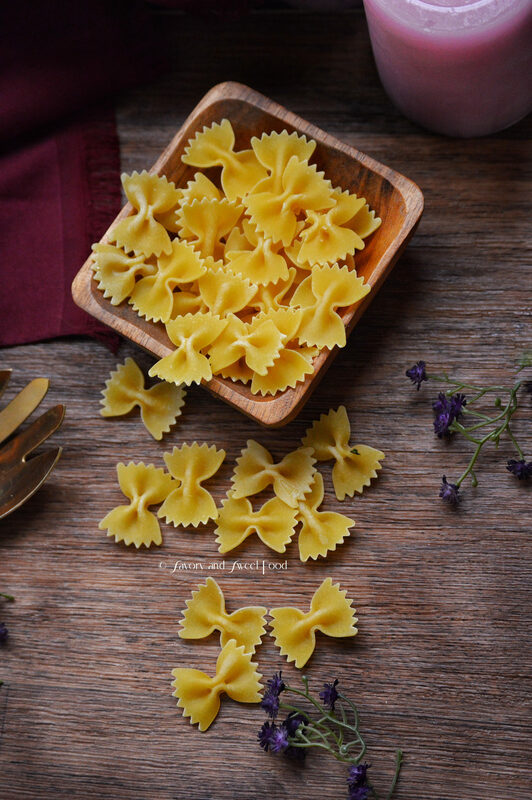 Please do check out my Pasta recipes folder in the recipe index here, there are many more delicious recipe there. 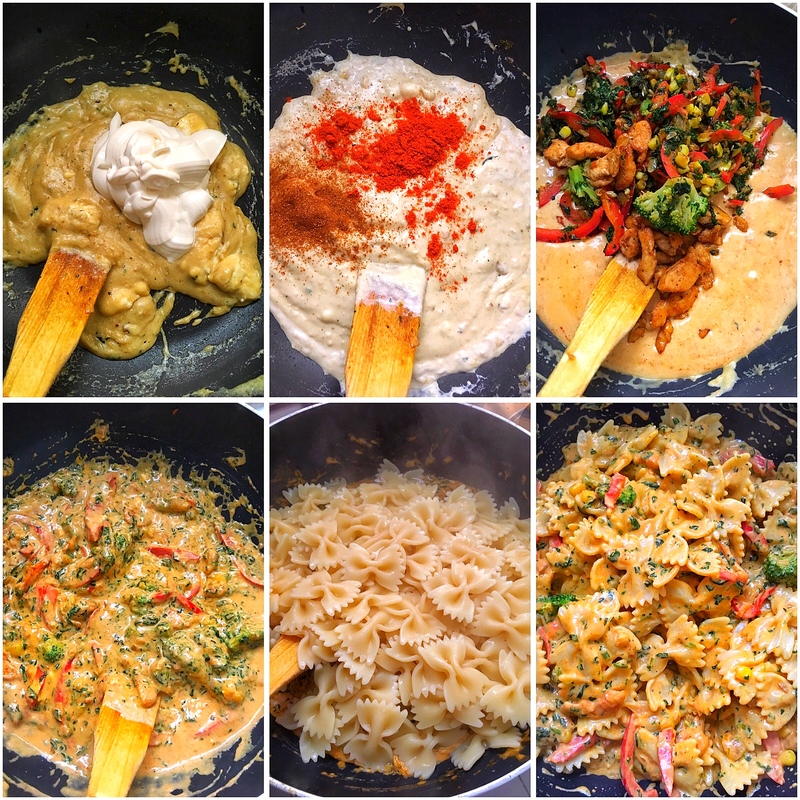 So continuing that tradition, today I bring to you this incredible recipe of Chicken Pasta in Cream Sauce. I am so sure that you all will love this one. It is not very difficult to make this and the flavors are amazing. 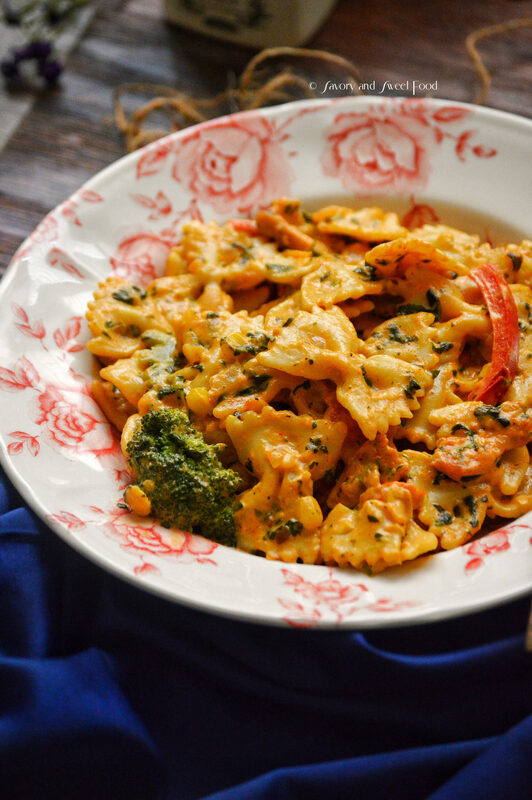 It can be called as a kinda healthy pasta because hey, it has veggies in it. 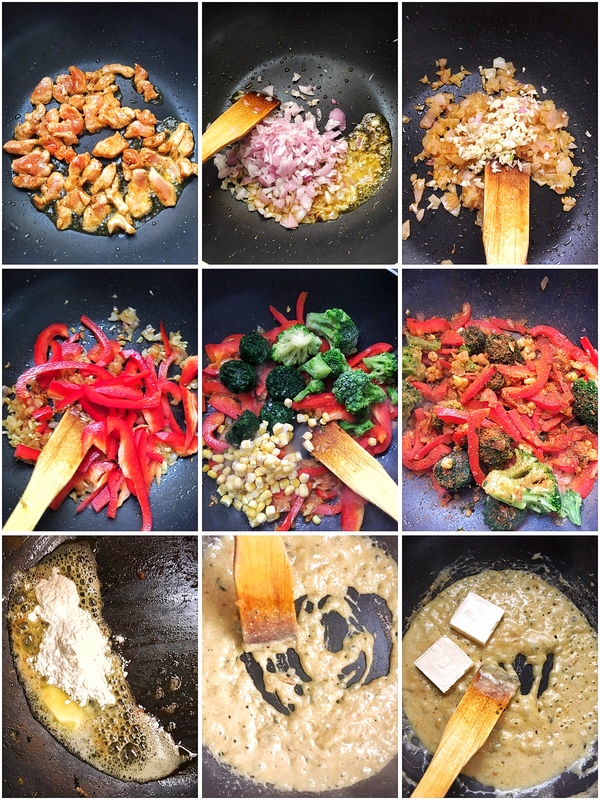 Let’s not focus on the fat content in the sauce and only concentrate on the broccoli, spinach et al. 😀 So here goes the recipe, enjoy! I used farfalle pasta here. If you are going to use the same pasta, remember that the cooking time for this one will be longer than penne or fusilli. You can add any vegetables you like in the pasta. Mushrooms, asparagus etc can be added too. You can make this a pasta bake too if you like. For that after the pasta is ready, place it in a baking tray and sprinkle mozzarella on top and bake until cheese is melted. Meatballs can be used too. I didn’t mention the quantity of the veggies, you can add as much or as little as you like. Marinate chicken in the above mentioned ingredients. Shallow fry it in olive oil. Keep aside. Cook the pasta as per package directions by adding salt and olive oil into the water. Drain and wash the pasta with water and keep aside. In the same pan add 1 tbsp butter and sauté the onions. When it turns soft add in garlic and mix for a minute. Add In the capsicum and sauté for a minute. Put broccoli, corn and spinach (I used frozen). Add 1 tsp of cajun spice to the veggies. Cook for 5-7 minutes. Remove from pan and keep aside. Again in the same pan, add 2 tbsp of butter, when it melts add flour. Stir constantly till you get a nutty smell. 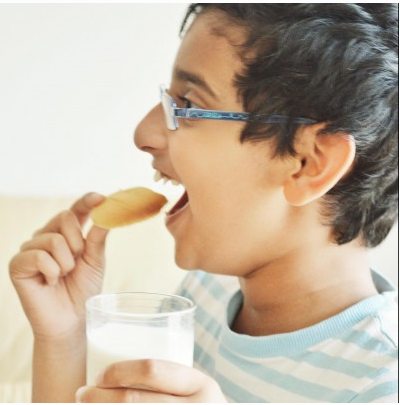 Pour in the milk gradually whisking well to avoid lumps. Cook on low heat till it thickens. Pour in the stock and mix well. Add the herbs, cream and cream cheese. Mix well till you get a smooth sauce. Add in red chilli powder, paprika and 1/2 tsp of cajun spice. Mix well. Add in the chicken and the veggies back into the sauce. Combine. Add salt if needed. Add in the cooked pasta into the sauce and stir to combine. I didn't mention the quantity of the veggies, you can add as much or as little as you like. Beautiful pictures. i lovveeeee pasta. This is going to be in my bucket list for the weekend. Thank YOU Safa! Hope you like it. I’ve made this dish God knows how many times! It’s sooo delicious! Definitely my favourite pasta dish.